RBTH presents a selection of views from leading Russian media on international events, featuring reports on U.S. Secretary of Defense Ashton Carter’s visit to Europe, the beginning of work on the Turkish Stream gas pipeline, and the possibility of Israel joining the Syrian conflict. The West is preparing for a long confrontation with Russia even after Russian President Vladimir Putin leaves the presidency, writes website Gazeta.ru. This was announced by U.S. Secretary of Defense Ashton Carter during his tour of Europe, whose main purpose is to develop a common strategy of cooperation between NATO member states in response to Russia’s actions in Ukraine. 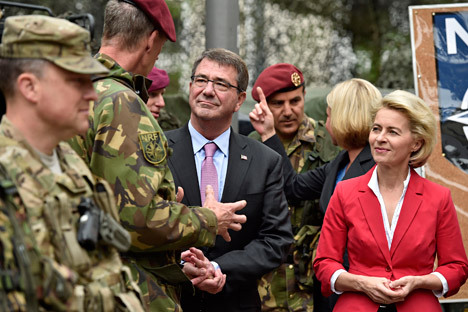 The Pentagon chief arrived in Berlin for talks with the German defense minister on June 21 and will subsequently visit Estonia before ending his trip with a meeting of NATO defense ministers in Brussels. Carter's remarks confirm that the bloc’s policy toward Russia has not changed and will not change in the near future, said deputy director of the Institute for U.S. and Canadian Studies, Viktor Kremenyuk. Gazeta.ru reminds its readers that the Pentagon is discussing a plan to send heavy weaponry to Eastern Europe to “deter possible Russian aggression,” as well as considering the possibility of deploying in Europe or Asia missiles aimed at countering Russia's nuclear potential. However, the experts interviewed by the website noted that NATO still has no consolidated position on this issue. “There has been if not a split, but disagreement on Russia and the Ukrainian crisis,” Yury Rogulev, director of the Franklin D. Roosevelt Foundation for United States Studies at Moscow State University, told Gazeta.ru. “The Baltic countries and Poland demand an increase in weaponry and are ready to place bases and weapons on their territory. France and Spain are neutral about this, or are inclined toward negative attitudes. There are still a number of Eastern European countries that are against it; Slovakia, the Czech Republic and Greece are calling for the normalization of relations with Russia,” said Rogulev. A pipe-laying ship has finally emerged from a Bulgarian port, where it has been waiting for six months, to commence work on the route of the Turkish Stream gas pipeline linking Russia to Turkey via the Black Sea, the website Vzglyad reports. It can therefore be assumed that the implementation of the pipeline project, which is of vital importance for Russia as it should finally solve the problem of Ukrainian transit, has essentially begun, writes the publication. Vzglyad points out that Turkey granted a permit just a few days after Greece had signed a memorandum with Russia to build an extension of the Turkish Stream pipeline. Other experts do not exclude that Turkey became more accommodating after Russia signed a memorandum with the Germans to construct two new branches of the Nord Stream pipeline under the Baltic Sea with a capacity of 55 billion cubic meters. By doing so, Moscow made it clear to Ankara that at a pinch it can deliver additional gas to the European Union without the help of the Turkish Stream pipeline, writes the publication. Dmitry Abzalov, president of the Center for Strategic Communications, said in comments to the website that much of the gas can be pumped through the northern circuit if the Turkish Stream project is delayed. However, he recalled that it is necessary to wait for a full-fledged agreement. The business daily Kommersant reports that Israel may become involved in the Syrian conflict. The newspaper explains that the Israeli authorities may abandon their principle of non-intervention due to the growing threat to the Druze community in Syria. Since the end of last week, heavy fighting has been taking place near the Golan Heights, occupied by Israel since 1967, the newspaper reports. The Druze are an isolated ethnoreligious group with significant communities in Syria, Lebann and Israel. “The union of Druze and Jews is now undergoing a serious test. I recall that if anyone in Syria recognized Israel's right to exist, it was the Druze. Israel does not have many supporters in the region and they should be valued,” Mordechai Kedar, an expert of the Begin-Sadat Center for Strategic Studies in Israel, told Kommersant. Although the dispatch of Israeli troops into Syria is not yet a matter of discussion, one of the options could be sending military supplies to Syria’s Druze, the newspaper says. However, this may be not sufficient, according to the experts who spoke with Kommersant. “Israel often acts as a moralist, when it comes to others. Now it is time to show an example,” said Kedar.